Herts Way 4.1: As well as joining the ever-growing ranks of the Village Sign series, this cache is the first of those placed along Leg 4 of the Hertfordshire Way Series. There is room for the log book only, so please bring your own pen. Stealth is required. A group of cachers have gathered together to place caches along The Hertfordshire Way; a 194 mile circular route along public rights-of-way within the County of Hertfordshire. Rather than caches at every 0.1 mile we have tried to put together interesting hides. 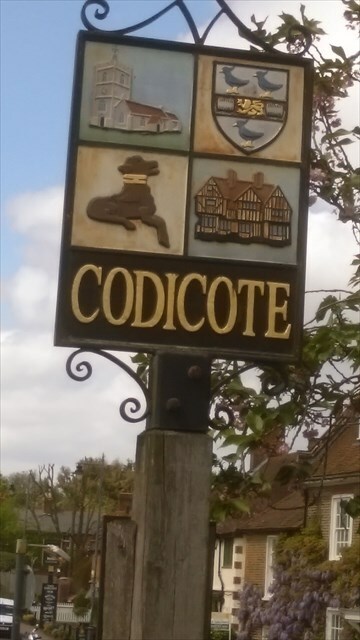 Leg 4 stretches from Codicote to St. Albans for 12.6 miles. We advise that you bring sturdy boots for very muddy terrain and a high visibility vest with you because a couple of short sections require walking along the road. From the village sign itself, take the right hand fork - along the St Albans Road. In about 250 yards, take the (not very obvious!) footpath on the right, between houses. There is a 'Herts Way' sticker on the nearby lamp post - keep your eyes peeled!